But the most remarkable thing about her coming into the parish, was the change that took place in Christian names among us. Old Mr Hooky, her father, had, from the time he read his Virgil, maintained a sort of intromission with the nine muses, by which he was led to baptize her Sabrina, after a name mentioned by John Milton in one of his works. Miss Sabrina began by calling our Jennies Jessies, and our Nannies Nancies; alas! I have lived to see even these likewise grow old-fashioned. She had also a taste in the mantua-making line, which she had learnt in Glasgow; and I could date from the very Sabbath of her first appearance in the kirk, a change growing in the garb of the younger lassies, who from that day began to lay aside the silken plaidie over the head, the which had been the pride and bravery of their grandmothers; and instead of the snood, that was so snod and simple, they hided their heads in round-eared bees-cap mutches, made of gauze and catgut, and other curious contrivances of French millendery; all which brought a deal of custom to Miss Sabrina, over and above the incomings and Candlemas offerings of school; insomuch that she saved money, and in the course of three years had ten pounds to put in the bank. I see that it was a BBC Radio Book at Bedtime in 2017, surprisingly: in that I’d have thought that would’ve introduced it to people and there would have been more talk about it. I got hold of it after reading a fascinating article by Ursula Le Guin at a site featuring ‘B-sides’ – 'great books that time forgot'. Her review is here, and is (of course) excellent. Annals of the Parish is the fictional diary of a Presbyterian minister in a rural parish in Ayrshire, Scotland, from 1760 to 1810, and is entertaining, involving, affecting, informative, and very very funny. There is an ‘entry’ – of varying lengths - for each year in that time: in this sense the book resembles the Jane Smiley trilogy that began with Some Luck, with a similar idea of covering each year in turn. I wondered if Smiley had read the Galt book. Le Guin says she was expecting something like Walter Scott, then decided it was more like Jane Austen, and then finally went for Elizabeth Gaskell’s Cranford as the best comparison. It is a delight. It tells the story of one small community over those 50 years, and I had to keep reminding myself that it was fiction, it seemed so real. The Industrial Revolution impinges on the village, and so do the French Revolution and the American War of Independence. By the end, King George III needs a Regent because of his mental problems, and the Napoleonic Wars are in full swing: and our Rector is retiring. And in between people fall in love and they get married and have children. There are sad deaths, there are travellers who leave the village and return, and some who don’t. There are happy stories and sad ones, people get richer or get poorer, or both in their turn. And the world moves inexorably on. I loved this book, even though there were a lot of Scottish dialect words I didn’t know – sometimes the dictionary had them, but not always: but I never was not able to work out the rough sense of the words. In the passage above, ‘snod’ means neat, as you might guess. The book starts, hilariously, with his new parishioners objecting to his appointment, and nailing up the door of the church. The Reverend Balwhidder would like to break open the door in a grand gesture, but is aware this would have to be paid for. So he climbs in through the window, and out again at the end of his investiture. It is a splendid start. Of course, he goes on to win the affection of his flock. He is honest and open about himself – he describes someone objecting to his ‘humdrum preaching’ – but still there are elements of his small vanities and conceits which come through delightfully. The Minister reminds me of the real-life Patrick Bronte, father of Charlotte, Emily and Anne – particularly as they both set off to find another wife after being widowed (though the Rev Balwhidder has more success than Mr Bronte had). You can find both free and very cheap versions of the book for Kindle. 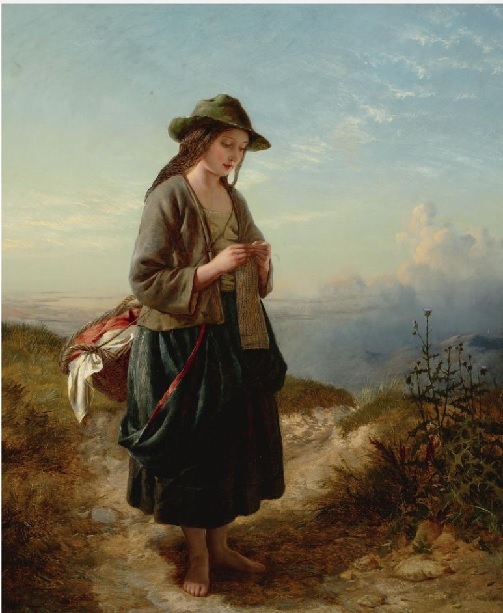 The top picture is called A Scottish Peasant Girl Embroidering Muslin at Luss, Loch Lomond. 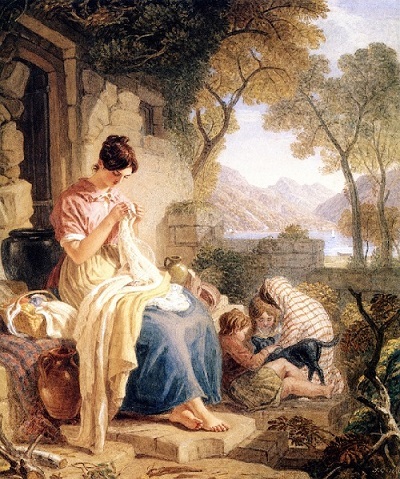 I am quite sure Sabrina doing her genteel sewing and millinery in the book would be horrified at the idea that she was a peasant, but am equally sure that this painting is a most glamorized and unlikely picture of a poor girl’s clothes and surroundings, so that seems to even out. It is from later than the date of the book, is by Joshua Cristall, and is from the Athenaeum website. The other picture is of a crofter's daughter, who might have changed her headcoverings and her name, to the disappointment of the minister. It is 1853 so again too late really, by Edward John Cobbett, same source. Oh, how intriguing, Moira! Honestly, I've never heard of this one before (why do some books stay that obscure, and others not.....), but it does sound like a treasure. I like it when wit is woven through a story - especially that sort of wit about one's own society. And the setting is irresistible. Little wonder you enjoyed it as you did. I enjoyed it so much Margot - real social history but within a lovely framework. Where's her embroidery hoop? I think she's knitting a Shetland shawl, and the second one is knitting a sock. We'd have to check where the title of the picture came from - added later maybe? I love it that people knitted walking along. It can be downloaded from archive.org in several formats. I'll have to put this on my (ever-growing) list.